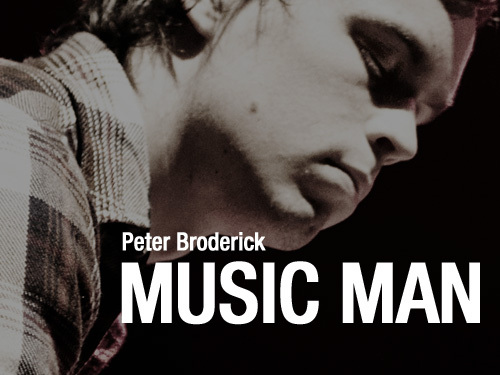 Originally hailing from Portland, Oregon, multi-instrumentist Peter Broderick currently resides in Copenhagen, where he moved to toward the end of last year after Efterklang inviting him to join the band for the tour that followed the release of Parades, their album of last year. Broderick has recently released a beautiful mini album on Swedish imprint Kning Disk entirely made of instrumental piano compositions, and his debut album, Float, is about to be released on Type. We caught up with him as he was about to embark on yet another leg of the Efterklang tour to talk about the multiple facets of his work, living in Europe, recording on a shoe string and endorsing a one-man band persona on stage. Peter, thank you very much for taking the time to answer a few questions for themilkfactory. You have been touring with Efterklang for quite some time now. Where are you at the moment? Right now I’m on a bus in Copenhagen, heading back home from the studio. Leaving tomorrow for five weeks of touring. Although you are originally from Portland, Oregon, you currently reside in Amsterdam I believe. What made you come to Europe, and how do like over here? Do you have a certain affinity with Europe? Actually I’m living in Copenhagen, Denmark at the moment. I moved over here last September when Efterklang invited me to move to Denmark and join their live band. I really love it over here. My work permit runs out in October this year, so at that time I may have to move back to the US, but I’m hoping I’ll be able to figure out a way to stay over here. At the end of last year, you released a beautiful mini album, Docile, on Swedish imprint Kning Disk, on which you collected ten compositions for piano. How did the project come about? Mattias who runs Kning Disk contacted me early last year, just offering to send me some of his releases for no apparent reason. When his packaged arrived I fell in love with the music (Erik Enocksson, Jerry Johansson, James Blackshaw, etc. ), and also with his design and packaging, most of which he hand assembles. So then we started talking about making a release together, and I told him I had always wanted to make a solo piano album. He said this was perfect because he had planned to start a series of solo piano albums from different artists, and that I could start the series. So the next week I wrote ten short songs on the piano and went into the studio to record them shortly thereafter. And then a couple months later I found out I would be moving to Scandinavia, so when it came time to put the album together, I made a trip to visit Mattias in Gothenburg, and we cut and glued the CDs together. Now he’s one of the best friends I have. There is a mention of the cover that says that the album was recorded in less than an hour, one night in June last year. Did you record it live? Well, the reason I recorded it so quickly is a bit funny… I had regularly been doing session work at a really nice recording studio in Portland called Type Foundry, and I was really in love with the old upright piano and two inch tape machine they had there, but I knew I couldn’t afford to go in there and make a record myself. So I asked the engineer if I could buy just one hour of studio time, which sounds a bit ridiculous, but he agreed. So I practiced up on those ten little songs, and when I got into the studio, I had hoped I could record it all in one take, but I messed up on the sixth song. So the first half is all live, and then I had to go back and redo a couple songs in the second half. You play quite a lot of instruments, from violin, cello, guitar and trumpet to piano, accordion, drums and musical saw. On the cover of Docile, you are quoted saying how playing the piano is one of your favourite past times. The piano is also very present throughout Float, your new album. Would you consider is as your main instrument, and how did you get to play of so many other instruments? My main instrument is the violin. Or at least it’s the only one I’ve had training on. When I was in high school I started collecting instruments, and slowly trying to teach myself how to play each one. Many of them I’m quite limited on, including the piano, but I enjoy all the different sounds. The piano is my favorite instrument to play by myself because it’s so full and rich. I can just sit down and strike a chord, and put my ear into the piano, and get swallowed up by the sound. Your music encompasses quite a few genres, from classical to folk to pop occasionally. What made you to want to play music, and compose? Are there particular artists or musicians who have influenced you when you were growing up? I come from a family of musicians, so I suppose I’ve always been playing music. Certainly I’m influenced by other artists, and I’m always seeking out new music to listen to and getting little ideas from other people, but I also find a lot of inspiration to write music just from day to day experiences and being with family and friends, or being alone. You also occasionally sing, although this is quite rare on record. Is this a side that you would like to explore in the future? Is your approach to songs different from instrumental music? When I recorded Float (end of 2006 to beginning of 2007), I think I thought I wanted to make primarily instrumental music. I’ve always made music with singing, but it’s always made me uncomfortable to a certain degree, so I felt safer to record music without singing. But at that time I hadn’t played a single live show by myself. And since then I’ve toured all around Europe playing solo, and I’ve found myself playing a set that’s half instrumental, piano and violin based, and half songs with guitar and singing. I really love the contrast between the two, and I’ve become more comfortable with singing. So, my next album will be based around voice and guitar. After making Float, an album based around piano and strings, I wanted to see if I could make an album with neither. So that’s what I’ve done. I’m not sure yet about the release details, but I expect it to be out sometime later this year. The press release for Float compares your music to that of Max Richter or Sylvain Chauveau which doesn’t quite do justice to the scope of your work. What do you think of these? It’s funny you mention that because I haven’t even seen the press release for Float… But I could see why Float would be compared to those two artists, and both of them I absolutely love. I think it’s fine… But I think comparing my newer music with guitars and singing to Max Richter or Sylvain Chauveau might be a bit of a stretch. You released a seven inch single on Type at the end of last year, and your debut album, Float, is about to be released, once again on Type. How did you get to work with them? At the time I finished Float last year, I was avidly following Type records. It seemed like I was buying another Type release each week. There’s some really amazing music in the Type catalogue. And then one day I sent them a message on MySpace, just saying I loved the label, and thanking them for releasing wonderful music. John at Type then took the time to go to my page and listen to some music, and then he wrote me a message saying I should send in a demo. So I sent Float to him, and he responded the day he got it saying he’d like to release it. It was perfect. I think I walked around the whole next week with a huge smile on my face. How do you occupy your days as the release of the album approaches? Are you nervous/relieved/looking forward to it being out? As you may know, Float has been very delayed. Originally it was planned for September/October 2007. But there have been several problems with mastering and manufacturing and distribution, etc. So, at this point I’m just very ready and happy for it to be released. I’ve been sending out a lot of promos to people I promised to send to months ago. It feels good that things are finally moving along. There is a continuity throughout the album, with recurring themes in the music, and there also seem to be some continuity in the titles (A Snowflake, A Glacier, Broken Patterns…). What process did you follow while working on the album? What inspired you to do it like this? Before I went into the studio I had already written the skeleton for the entire album from start to finish. So in that way I see it all as one big piece. And I’ve always liked the idea of expanding upon simple themes in music. Taking one small piece and trying to make the most of it. I think it’s partly a minimalist concept – making one melody into four different songs. And it’s also something I did a lot studying music theory – taking a melody and putting it in different contexts – from a major key to minor, changing the chords underneath, etc. I also draw inspiration from film scores that have returning themes throughout. You have been touring as part of Efterklang’s live set for a few months now, and you also played on their last album, Parades. How did you get to work with them? I’ve been an enormous fan of Efterklang for years. Their album Tripper from 2004 was one of my all-time favorites. And I actually just met them by sending a friend request on MySpace. I sent them some CDs of my own, and I’ve been in loose contact with the lead singer, Casper, over the last couple of years. I thought it was amazing that they even knew who I was, and when they sent me an email last June inviting me to move across the world and join the band, I was completely floored. They were just throwing out a wild idea, and to me it sounded like an absolute dream come true. So I basically dropped my entire life in Portland and moved to Denmark. But actually, I didn’t play on Parades. They made the album well before I met them in person. Hopefully now that I’m here they’ll invite me to participate in some new recordings – we’ll see. Having played with the band for quite some time now, do you think it influences your music in any way? Yes. I’m inevitably influenced not only by the music, but by the experiences we have together. I was lucky enough to see you open for Efterklang in London at the wonderful Bush Hall in November last year. When you play live, you record musical phrases that are then looped and layered, which allows you to progressively add various instruments while being on your own on stage. How did you get the idea of working like this? Well, since I’m only one person on stage, I use a pedal to loop myself so that I can add more layers and make it something bigger. It’s a fairly common thing these days to use a loop station, but I try not to rely on it too much – throwing in a song or two each night that doesn’t use loops at all. Although you made it look quite easy, it must be quite demanding to perform all the parts yourself. How do you keep track of what’s going on? When I first started using the loop pedal I had to practice and think a lot, but actually now I don’t really have to think about it. It’s become fairly natural, just like an instrument, which is nice. There seemed to be an element of improvisation during your set. Do you intentionally leave some free space in your set to take advantage of a particular mood or do you have a set list of songs you want to play when you go on stage? I do usually write a set list, but there are places in most of the songs where I can basically do whatever I want, and it usually changes depending on the environment of the venue. I think it’s important to try and find a way to do something different at each concert when you’re playing concerts every night – keep things fresh! Are you planning to tour alone after Float is released? Right now I have so many touring plans with other bands that I can’t really think about trying to do a big solo tour, but I’ll be doing lots of festivals and things in the summer I think. Beside your solo project and playing with Efterklang, you are also member of a folk band called Horse Feathers, which is yourself and Justin Ringle. You have released a first album in 2006, and you have just been signed to Kill Rock Stars and are due to release a second album later on this year. Can you tell us more about the project? Sure, Horse Feathers is a band I was playing in a lot when I lived in Portland. The first album was just me and my old house-mate, Justin Ringle, but then my sister joined the band after that, playing cello and singing, and she’s a big part of the new album due out in the fall. In that band Justin is the lead, and I play accompaniment, primarily on violin, but also with lots of other little things (banjo, mandolin, saw, percussion, voice, etc.) In October I’ll be going back to the States to tour the US with them in support of the new album. The Portland music scene seems to be quite active at the moment, or at least, there seem to be a lot of focus on what’s happening over there. Do you denote an unusual level of interest about artists who come from the city? Do you feel you are part of it despite living away? Portland is definitely a very musical city. There were times when I was playing with five or more bands when I lived there. In a way it’s been nice to get away, because when I lived there I was putting so much time into other bands that I hardly had time for my own music, so I feel a bit more focused here. But I’ve made a lot of great musician friends there, and I hope I’m still connected despite being so far away. Once you’ve finished with this interview, what’s next in your diary? It’s a busy day today. Tomorrow I leave for tour, so I need to get ready for that, and before I leave I need to have the score finished for a short film by an Irish director. So right now I’m off to work on that!